Hamby Home(in)stead ...: Bright idea! Our insulation efforts are proving very effective - and we certainly notice a difference if venturing from any of the front areas to the smallest room in the house! There was no toilet window curtain when we moved in. I found an odd double-layer lace item at an op-shop. It may have been a dressing table skirt. Whatever it's previous use, the length of lace was cheap at a dollar and till now has afforded good privacy. Of course, lace doesn't offer any insulation in winter! I found a warmer window covering today in the form of a small, lighter-weight quilt. I hung it over the curtain rod, then folded the edges under (to adjust the width) and pinned them in place. The bright colours prompted a mini makeover, which included hanging some more of Vaughan's artwork. I found a new tapestry frame at an op-shop today. It was $5.00 (though still had it's ancient $25.00 original price tag). Seemingly tapestry frames don't have glass, which I didn't notice till I unwrapped the packaging at home. Oh, well - I'm sure Vaughan's ladybugs don't mind! 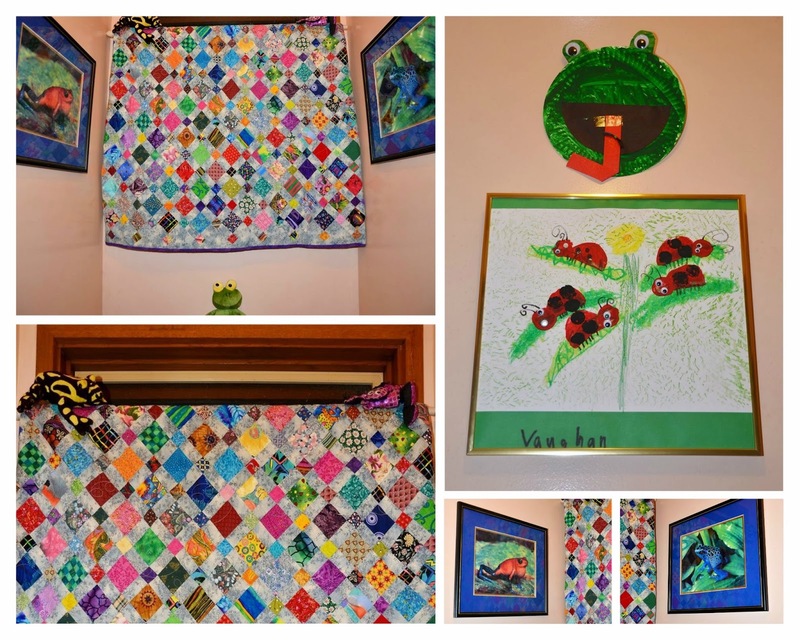 The ladybugs and frog mask have been hung opposite the now-quilted window. I've had the frog prints for many years. They were my two favourites from an old calendar, so I had them professionally framed, way back in 1997 - and yes, I still like them! I'm hoping the window quilt causes a dramatic improvement to the temperature of the room. Fingers crossed for frog-tastic results!